Stones measure 8" x 2 5/8"
Special Price $149.99. SAVE $63.48 Off List Price! Save Big with the DMT DuoSharp Plus Diamond Kit! You Get All 4 Grits and a Stone Holder for Only $149.99. 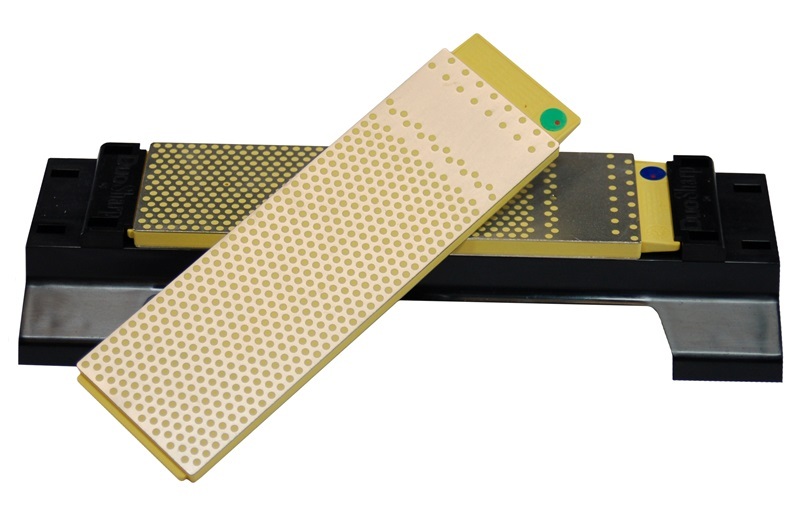 Take the guesswork out of selecting a set up quality sharpening stones. We created this kit to be a complete matched set at a great price. You get all four gits and the versatile DMT DuoBase. This kit contains two double-sided 8" x 2-5/8" DMT DuoSharp Plus Diamond Stones, one Extra-Coarse/Coarse and one Fine/Extra-Fine, as well as the handy sharpening base. 8" Coarse/Extra Coarse DMT DuoSharp Plus Diamond Stone - The Coarse/Extra Coarse stone is used when your knives or tools are dull. The extra coarse grit is a 220 mesh diamond grit (60 microns) that will quickly put an edge on just about anything. The next step is the coarse grit which features the 325 mesh (45 micron) diamond grit. The coarse grit is used after the extra coarse to refine the edge or when your edge is just moderately dull. 8" Extra Fine/Fine DMT DuoSharp Plus Diamond Stone - The Extra Fine/Fine stone is used to refine an edge. Unless you have an already sharp edge, this stone is used after the Coarse/Extra Coarse. The fine grit is a 600 mesh (25 micron) diamond grit. This fine grit will leave a nice edge. The Extra Fine side is used to finish your edge. Because it is a very fine 1200 mesh (9 micron) diamond grit, it is ideal for finishing and polishing your edge. The Bench Stone Holder will hold either of your 8" DMT DuoSharp Stones. There are clips that hold the stone securely in the holder. Switching grits is as simple as unclipping and reclipping the new stone. The stone holder also has an integrated handle on the bottom. The integrated handle allows you to hold the stone in one hand and use your it to sharpen larger tools. A non-skid mat is also included so you can sharpen without the base if you prefer. We recommend the 8" DMT® DuoSharp® for woodworking tools, kitchen cutlery, and outdoor knives. The 8" long by 2-5/8" wide stones are a convenient size that is large enough for a wide variety of knives and tools. The "plus" feature on these stones is the area on the end of the stone that is continuous diamond material, instead of the traditional interrupted material found on regular DMT® DuoSharp stones. The continuous diamond material works on pointed tools where the interrupted material might catch the tip of the tool. We put together this special kit to save you money when you purchase all 4 grits of the DMT 8" DuoSharp Plus Diamond Stones. DMT products are made in the USA. Q. What size stones do I need? A. 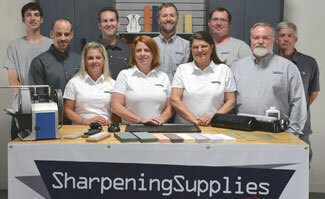 Many sharpeners will find the 8" DuoSharp Plus stones to be more than large enough to meet their needs. However, in some cases a longer or wider stone may be desirable. A good rule of thumb for knife sharpeners is to use a stone that is at least as long as their longest knife. Woodworkers will find that a stone that is at least as wide as their widest blade will be most useful. If your knives or tools would be better sharpened on larger stones, consider the 8" x 3" 8" Dia-Sharp Kit, the 10" x 4" 10" DuoSharp Kit, or the 11-1/2" x 2-1/2" 11-1/2" Dia-Sharp Kit.